John Krahn, age 89, passed peacefully after a brief illness and went to be with his Lord and Savior on Wednesday, November 14, 2018 at the Cypress Regional Hospital, Swift Current, SK with his family by his side. John is survived by his loving wife of 64 years to the day, Katherine “Tina” Krahn (nee Dyck); his children, David (Donna) Krahn, Ernest Krahn, and Tim (Angela) Krahn; his son-in-law, Harry Friesen; his grandchildren, Jolene Friesen, Sharlene (Kendall) Dunnett, Kara (Tate Cao) Friesen, Kyla (Jeremy) Patzer, Landon Krahn, Kaitlyn Krahn, Brianne Krahn, and Allison Krahn; his great-grandchildren, Jacoby, Jada, and Kenzie Patzer, and Katrina Dunnett; and by many nieces and nephews. 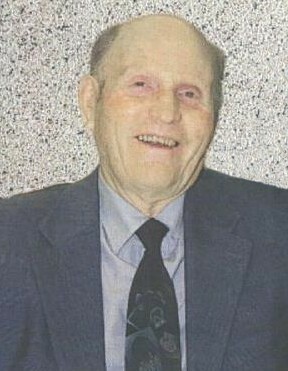 John was predeceased by his daughters, Ruth and Debra in infancy, Barbara in 1964, and Gertrude “Trudy” Friesen in 2001; and by his eleven brothers and sisters. John Krahn was born July 26, 1929 to Isaac P. & Agatha Krahn in McMahon, SK and grew up on the family farm. He met Katherine “Tina” Dyck and they were married on November 14, 1954. They took over the family farm, where they raised their children. John took a keen interest in all aspects of farming — John Deere machinery, Ford vehicles, and Belgian horses (in fact, any good-looking horse). He insisted on Hereford cattle, raising pigs and chickens was just a necessity to provide for the family. John & Tina worked tirelessly together on their farm and were very proud of how the farm turned out. John had fond memories of time spent on trail rides with family and friends, camping at Cypress, and the annual Christmas hay rides until they sold the farm. They built their dream house on an acreage near Swift Current and then later moved into their present home at Riverview Village Estates. He was a loving and caring husband, father, grandfather, and great-grandpa. He will be lovingly missed for many reasons, among them his strength and faith. Every year he would read the Christmas story to the family. This year he will be especially missed, but the tradition of the Christmas story reading will continue on. The Funeral Service for John Krahn was held on Saturday, November 17, 2018 at 11:00 am from Trailview Alliance Church, Swift Current, SK with Pastor Blair Froese officiating. “What a Day That Will Be,” “Great is Thy Faithfulness,” and “It is Well With My Soul” were sung by the congregation under the leadership of Marv & Talita Hildebrand, with Wendy Patzer serving as pianist. The eulogy was given by David Krahn and the tribute was given by Jolene Friesen. Jeremy Patzer and Landon Krahn gave the obituary. The Private Interment Service was held prior to the Funeral Service from the Rhineland Cemetery, Rhineland, SK with Harry Friesen, David Krahn, Ernest Krahn, Tim Krahn, Kevin Krahn, and Landon Krahn serving as Pallbearers. In memory of John Krahn, donations made to the Trailview Alliance Church Missions Project would be appreciated by the family.